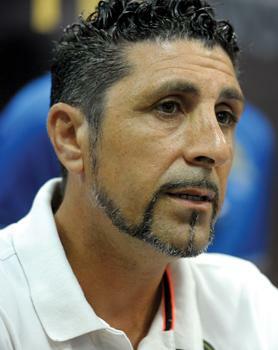 Paul Zammit will be coaching Valletta for the next three years. Paul Zammit is officially back for a second spell at Valletta FC as yesterday club members were told during an annual general meeting that the former Birkirkara FC coach had agreed to sign a three-year contract. Zammit, who left the Stripes after leading them to the FA Trophy title last month following a 2-0 win over Hibs in the final, will be starting his new job this evening when leading the first session of pre-season at the Senglea Athletics ground in Corradino. Last season, Valletta started with Gilbert Agius at the helm before the team’s reins were passed over to Ivan Zammit who led the Citizens to the runners-up spot in the Premier League. Valletta, along with Birkirkara and Balzan, will be playing in the first qualifying round of the UEFA Europa League with the first legs scheduled for July 2. Paul Zammit had led the Citizens to the Premier League title in season 2007-08 and news of his appointment yesterday was greeted with a huge round of applause by the supporters present for the meeting. It was also confirmed yesterday that Cameroon striker Njongo Priso, 26, will be back in a Valletta FC shirt next season after agreeing on a five-year deal. Valletta lost captain Ryan Fenech to Balzan in the off season but they’ve already secured the services of three new foreign players besides Priso who intends to apply for dual citizenship as he is married to a Maltese woman. The new overseas players are Tunisians Sami Ayouni, Marouen Troudi and former Moldova U-21 defender Maxim Focsa. Meanwhile, Valletta FC president Victor Sciriha was confirmed for another term yesterday as were vice-presidents Paul Spiteri and Alexander Fenech. Joining the team of officials in the committee were newcomers Antonio Bisignani, an Italian businessman, and Roderick Axisa. The latter will be replacing Michael Palmier as club treasurer. Among the items discussed during the annual general meeting was the stretch of land which the club was given by the government years back to construct a new stadium in Hal-Farrug. Club members were told that detailed plans had already been submitted at MEPA but an im-passe developed. Now, Valletta FC are urging the authorities concerned to come up with other alternatives if the site in the limits of Luqa cannot be developed as a football ground.